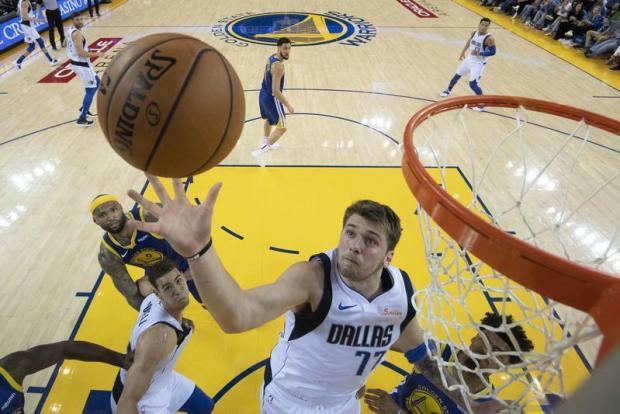 Luka Doncic had a triple double and Dirk Nowitzki underlined his final game at Oracle Arena with a throwback performance as the Dallas Mavericks handed the Golden State Warriors their worst loss of the season on Saturday. Doncic finished with a game high 23 points, 11 rebounds and 10 assists and Nowitzki, who is likely in his final NBA season, scored a season high 21 points in a 126-91 blowout victory by the visiting Mavs. Germany's Nowitzki scored 10 of the game's first 16 points, helping Dallas seize a 14-2 early lead. He was cheered loudly in the introductions by the crowd at Oracle, which is scheduled to close at the end of the season. Nowitzki had five three pointers and Doncic and Maxi Kleber each drained four as Dallas outscored the Warriors 63-12 from beyond the arc to earn their first win in Golden State since 2012. The loss on their home floor came on a night when the Warriors chose to sit out Stephen Curry. The 35-point margin of defeat was the largest of the season for Golden State, eclipsing a 33-point rout by the Boston Celtics. The Mavericks had a 50-point win over Utah and a 38-pointer over Charlotte earlier in the season. Kevin Durant had 25 points in 29 minutes for the Warriors, who had won four of their previous five games. Durant missed all eight of his three point attempts. Elsewhere, Kemba Walker scored 18 of his game-high 36 points in the fourth quarter and the Charlotte Hornets kept their slim playoff hopes alive by rallying to beat the Boston Celtics 124-117. Walker added 11 rebounds and nine assists in his 23rd game this season scoring 30 or more points. Rookie Miles Bridges scored a career-high 20 points, Marvin Williams and Malik Monk added 13 points apiece and Dwayne Bacon scored 11. Charlotte won its second straight, improved to 33-39 on the season. Kyrie Irving led Boston with 31 points. Jaylen Brown added 29 points and Marcus Morris 15. Also, Trae Young scored 32 points, including a last-second, go-ahead clutch basket, as the Atlanta Hawks snapped the Philadelphia 76ers six-game winning streak with a 129-127 win.